In a year of many big stories both on and off the fields of play, the runaway winner for top sports story of 2017 from the Associated Press was the “NFL National Anthem Protests.” We couldn’t agree more. 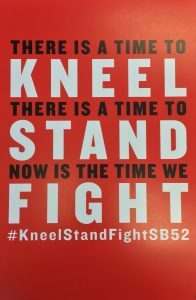 Initiated during the preseason of 2016 by the kneeling of then-San Francisco quarterback Colin Kaepernick, the demonstrations of NFL players were — are — part of a wave of activism on issues involving racism and police brutality among African American (and other) athletes, the likes of which haven’t been seen in the United States since the turbulent times of the late 1960s. This year, public attention to NFL activism appeared to be on the wane until September when our president issued an unprecedented, seemingly unprompted, and unusually profane series of attacks on athletic activists that singled out professional football players. For better or for worse, Trump’s attention provoked a tidal wave of protests and shows of support for protests across the league. And while Trump had his supporters, part of what propelled kneeling players back onto the front pages of newspapers and websites was the remarkable (and probably still under-appreciated) extent to which white teammates, coaches, and even owners joined activist athletes in demonstrations of sympathy and support both on and off the fields of play. And all this was just in September. Throughout the fall, sports sites tracked how many players were kneeling each week, who was supporting them, and how significant the backlash was. Pundits debated who “bore the burden” for bringing politics into sports, and whether this was best understood as a free speech concern, a labor issue, or a question of patriotism. And then there were NFL owners like Dallas Cowboys’ Jerry Jones. One week he was out there kneeling with players, the next he was insisting that protests would not be tolerated. Often it seemed like the only topic that was not talked about was the issues of persistent racism and police brutality that Colin Kaepernick and his like-minded NFL brethren had meant to raise in the first place. For better or for worse, Trump’s attention provoked a tidal wave of protests and shows of support for protests across the league. So, that was the news. But what is the discerning, sociologically-inclined sport fan to make of all this? What can we learn from the NFL’s tumultuous season of racial politics and protest? In the lead-up to the final game of the season — the spectacle called the “Super Bowl,” hosted this coming weekend in TSP’s hometown of Minneapolis, Minnesota — we want to take a look back at some of the issues we’ve seen and questions we’ve heard raised. It is an exercise that we believe reveals a great deal about America’s collective understandings of race and racism, as well as our ideals and assumptions about sport. One of the first and most basic questions many Americans have about the NFL demonstrations (not to mention athletic activism more generally) is why? Why do NFL players and African American athletes feel the need to protest, and why are they doing it during the national anthem? These are important questions — questions that themselves actually reveal a lot about the conceptions many of us have about athletes, anthems, and the conditions of race in America. Activism is almost always questioned in America — and many Americans, especially white Americans, have been critical of almost all race-based activism in recent years. That comes with the territory. After all, the whole point of protest is to highlight dissent and provoke opposition. We are especially interested in how questions about the legitimacy of protest are targeted at athletes and play out in the realm of sport. Underlying such inquiries, typically, are the assumptions that (a) these demonstrations are disrespectful and that (b) professional athletes are super-rich, superstar celebrities who should be so satisfied with their ability to make a living playing a game that they’d have no reason to complain about race or be angry about politics, much less act out in public. Often such questions implicitly frame African American athlete activists as spoiled complainers, more interested in making news and making money than anything else. They also tend to either downplay or dismiss the significance of the racial issues raised by activists altogether. For many Americans, in other words, athletic protests are as incomprehensible as they are inappropriate. Based on the athletes we’ve talked to and Hartmann’s earlier research on black athletic activism in the 1960s, we see the issue somewhat differently. In a society that continues to be plagued by disproportionate police brutality, persistent racial gaps, and overt bigotry and bias, many African American athletes feel compelled to do or say something. 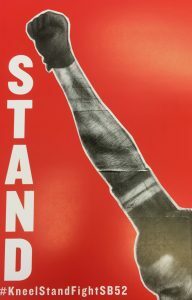 Sometimes it is quite personal, stemming from their own ongoing individual experiences with racism and discrimination. More often, activist athletes speak and act in support of communities of color — their communities — that continue to face persistent racism and discrimination. And almost always these gestures and statements are undertaken for quite principled reasons. In other words, athlete activists don’t take their activities lightly or think of them as disrespectful or anti-American. Quite the contrary, they understand activism as consistent with the higher moral standards, ideals, and aspirations of both American democracy and sport culture. They also know that their demonstrations are unlikely to produce concrete social change, and that they will confront backlash and opposition. Indeed, for many the whole point is to call attention to issues that are otherwise being ignored. Then, as now, successful African American athletes who do not say or do anything to express concern about racism and inequality (much less be explicitly critical of it) are often seen as complicit in supporting the racial status quo. Their excellence in sport is or can be used as a token of racial openness, opportunity, and fairness in society at large. In recent years, such sensibilities have made speaking out seem not so much a right for many African American athletes as a responsibility. There’s been a lot of talk about whether athletes have a right to protest. Some have construed this as a legal or first amendment-free speech issue. Others think of it more as a labor issue, focusing on contracts and agreements between the league and its union. (Even if they don’t like it, management and owners depend on black athletes as a workforce). But the prohibitions we are most concerned with here, and the ones that tend to get overlooked, are the cultural norms about protest, politics, and patriotism in sport. Athlete activists don’t take their activities lightly or think of them as disrespectful or anti-American. They understand activism as consistent with the higher moral standards of both American democracy and sport culture. A common refrain from many sports fans and the media throughout the fall was a sense of frustration, annoyance, or exhaustion — often followed by the suggestion that the sports world simply is not the right place for such demonstrations, discussions, and debates. Even if they sympathized with the players and their views, these people just didn’t think sports was the proper venue, especially not during the crucial ceremonial moment of the national anthem. There is a certain naiveté in viewing sport as a sacred, apolitical space, which Green and Hartmann have written about in TSP before. Sports and politics have long been intertwined in American culture. American football is a prime example; the abundance of “political” moments can be traced back to the early 1900s when only a few years after the sport’s origin, then President Theodore Roosevelt stepped in to “save” football with the creation of the NCAA (part of the whole muscular Christianity movement). Or, perhaps more relevant to today’s American professional sports landscape, one can look to the introduction of the national anthem in the context of World War II, not to mention the oh-so-common use of military flyovers and ceremonies for the purposes of recruitment into the Armed Services today. Though we don’t always think of these things as “political,” they clearly promote specific visions of national unity and solidarity — visions of the nation that not everyone may agree with or that can privilege one group over another. Nevertheless, the desire to keep politics and protest out of sports remains fairly constant and almost an article of faith among many American sports enthusiasts. We saw at least two variations on this theme play out over the course of the fall. One came from fans (and others) who see sport as purely a form of entertainment. These folks watch football and other sports precisely for the purpose of getting away from the regular news, from the muddy complexities and social conflicts of both everyday life. This low-brow, don’t-want-to-be-bothered form yielded some extreme and often racially-charged reactions (“shut up and play”), but generally it is seen in the more innocuous request for sports to just be a site of leisure, an escape. This crowd wants their athletes to play the game and not bring other issues and concerns into the safe, innocuous space of sports. Others take a higher road. In this second, more idealistic view, the athletic realm is — or at least is supposed to be — above politics and protest because it actually stands on higher moral ground than other popular pursuits. According to this way of thinking, sports — when practiced properly — are believed to be an inherently positive social force — breaking down barriers, transcending the social fray, and contributing to unity, solidarity, and a larger social good. The use of anthems, flags, and ceremonies only illustrates and enhances sport’s special status and function. Race is an important component of this romantic ideal of sport as a powerful, progressive and almost sacred social space. Sport leagues themselves often tout themselves as a leader in racial progress, celebrating their history of openness and access to people from all racial backgrounds. Further, they often attribute this history to a deeper moral commitment to fairness, meritocracy, and the virtues of unfettered competition. For students of sport and race, these ideals have their limitations. For example, they often make it tough to see racism and discrimination within the world of sport or yield an individualistic, meritocratic vision of racial justice that makes it difficult to address larger institutional or systemic inequities. (And this is not to mention all the work sport scholars have done to show how African American athletic prowess too often reflects and reinforces some of the worst Western stereotypes about black bodies, moralities, and mentalities). But whether high-brow or low brow, race-based protest just doesn’t seem appropriate in the context of all these pervasive cultural conceptions of sport. It is also worth noting that adherents to both these visions of sport as somehow special or sacred were often as annoyed by Trump’s attention to the racial politics of sport as they were/are by athletes’ statements and gestures. From a low-brow perspective, both Trump and the athletes protesting were guilty of making too big a deal of a game. Others saw Trump as sullying the purity of the game with his with brazen and profane destruction of the barrier between sports and politics. This can be seen in the impassioned defenses of the NFL that filled pre-game shows, players and coaches linking arms to protect “the Shield” during the national anthem, and New England Patriots owner Robert Kraft invoking unity and (a color-blind) harmony when announcing his painful break with his old friend Donald Trump at the beginning of this whole affair.If the sportsworld wants to be true to the ideals of sport as an arena for racial progress, social mobility, and fairness, these are conversations that cannot and should not be avoided. In any case, the back and forth between the anti-police brutality protests and Trump’s violation of the sacred vision of American sport and society disrupted the normally comfortable set of assumptions that ground sport culture as deeply intertwined with traditional democratic ideals of meritocracy and liberal individualism. And as is often the case in American society and American sport, race is at the center of such disruptions and contestations. We mentioned that a primary goal for most athlete activists is simply to call attention to racial issues that are otherwise ignored or minimized, and to get folks discussing and debating even if they don’t agree. So what kind of talk and debate about racism in America did the NFL’s season of protest engender? Did people pay more attention to and engage in productive discussion about race and racism as a result of the protesters’ provocations? There are several different ways to look at this. 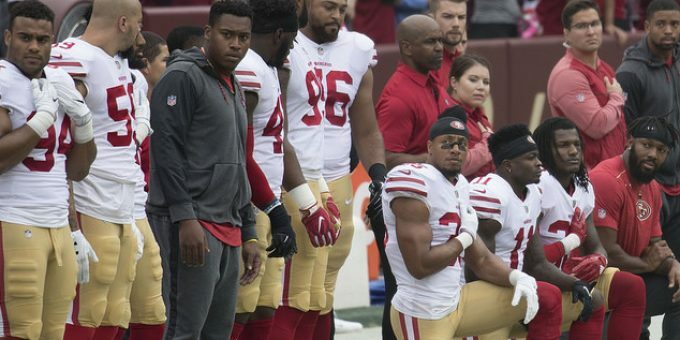 On the one hand, you can say that the NFL anthem demonstrations brought renewed attention to issues of racism and police brutality that athletes like Colin Kaepernick and so many others had hoped to put onto the national agenda. More than this, we might argue that these protests and demonstrations forced Americans — of all different backgrounds and political orientations — to take sides, or at least to no longer remain passive or ignore these issues. Sports pundits, fans, talk-radio, op-ed columnists, bloggers, and mainstream news networks have spent much air time and ink taking positions in favor or opposition of protest and athlete activism, and diagnosing how sports leagues should operate with regards to social issues. But other things, less positive and progressive for public discussions of race, happened in the fall of 2017 as well. For example, when Trump entered the fray, it became easier for many in the mainstream, especially white Americans, to effectively opt out of the racial discussion altogether. Trump’s right-wing conservatism made it easier to dismiss the protesters as liberal extremists, or even un-American, and settle into a comfortable middle-ground that was dismissive of talk of race in and around sport. In other words, rather than confront the complexities of race relations and social inequalities, Trump’s extremism made it easier to focus on the legitimacy (or lack thereof) of the protests themselves and ignore the complexities of race in America altogether. As the NFL season has neared its conclusion and effectively brought this episode to a temporary end, we saw yet another development. Even as the athletes have managed to make racism and racial injustice as part of the public discussion, much of the content came to focus on individual athletes and their racial views and experiences. Instead of talk about the seriousness of systemic racism within the criminal justice system and the persistence of racism in American life, public dialogue focused on the individual athletes doing the protesting and their relationships with the league and fans. Reflective of liberal and individualistic approaches to thinking about race, this watered down serious and complicated conversations about racism, and often contained them within the boundaries of sport, rather than society at large. Once again, we have a case of how American ideals — about individualism, sport as sacred, and visions of race, race relations, and racism — allow some conversations but make other, more sociological ones more difficult. We understand it is hard to talk about racism and inequality in American society, especially in a culture that is conflict-averse and a political moment that is chock full of unrest. We also believe that sports can be an important site for such conversations and exchanges — and that athletic demonstrations of the sort NFL players engaged in throughout the fall helped to provoke such conversations, even as they also revealed the challenges that racially-progressive causes face in mainstream, majority-white America. We also know that we are probably more sympathetic than most to the racial issues African American athletes feel compelled to prioritize for public conversation. However, if the sportsworld — by which we include reporters and commentators as well as owners, managers and even fans — wants to be true to the ideals of sport as an arena for racial progress, social mobility, and fairness, these are conversations that cannot and should not be avoided. 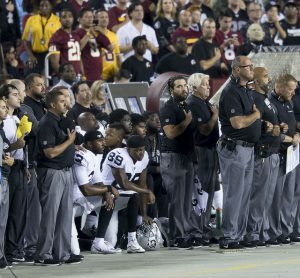 And in many ways, athletes kneeling or speaking out — about racism or police brutality or other social issues — puts that conversation on the table, and forces sports fans of all racial backgrounds and political orientations to consider the larger social and racial issues of the society in which they live. And let’s not forget about all of the other actions and gestures that the NFL protests have inspired. More athletes, at all different levels of sport, are willing to be more vocal and more public in their activism and engagement with politics. Additionally, more people — even some who had previously been skeptical about sport as a site of racial activism and place for political conversation — have begun to recognize the potential of athletic venues for larger efforts towards racial justice. This shift demonstrates the power of athlete activism amongst the athletic community, even if there is strong pushback from large portions of American society that exist outside of high level athletics. Remembering these basic facts is important — not only for our analyses and understandings of sport, but for any hope we may have to use our collective obsessions with athletics to make the world a better, less racist, and more equitable place. As for Sunday’s game, one team will win and the traditional White House visit may well once again become its own object of protest. Doug Hartmann. 2003. Race, Culture, and the Revolt of the Black Athlete. Chicago Press. Woody Doane. 2006. “What is Racism? Racial Discourse and Racial Politics.” Critical Sociology 32(2-3): 255-274. Joseph Cooper, Charles Macaulay, and Saturnino Rodriguez. 2017. “Race and Resistance: A typology of African American Sport Activism.” International Review for the Sociology of Sport. bell hooks. 1992. Black Looks: Race and Representation. South End Press. Jesse Berrett. 2018. Pigskin Nation: How the NFL Remade American Politics. University of Illinois Press. Thomas Oates and Zack Furness, eds. 2015. The NFL: Critical and Cultural Perspectives. Temple Press. Doug Hartmann is Professor and Chair of Sociology at the University of Minnesota; and co-publisher of TSP (with Chris Uggen). Kyle Green is an Assistant Professor of Sociology at The College at Brockport, State University of New York. He is a proud TSP alumnus and the co-author /co-host of Give Methods a Chance. Alex Manning is a PhD candidate in Sociology at the University of Minnesota. His research primarily focuses on race and sports, and their intersections with class, youth, culture, and families.